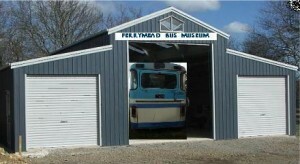 We have made a development application to Ferrymead Heritage Park to become a resident in the Park and to build a 15m x 12m bus museum which will house metalwork and woodwork workshops, a ‘small bus’ restoration area and have room for bus displays and a small theatrette. The design would of American Barn style, something like that pictured here. Cost will be in the vicinity of $65,000 so we will be doing a lot of fundraising once approval is granted. We now need to get the people interested in forming a Menz Shed to get in behind the group.